Vending Machines were recently added to the Battle Royale aspect of Fortnite, and they allow a player to trade in a certain type of material in order to obtain an awesome Weapon to use in battle. 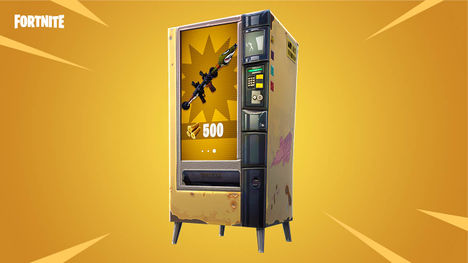 Like Weapons, Vending Machines appear in one of five different rarities: White (Common Weapon - 100 Materials Needed), Green (Uncommon Weapon - 200 Materials Needed), Blue (Rare Weapon - 300 Materials Needed), Purple (Epic Weapon - 400 Materials Needed), and Gold (Legendary Weapon - 500 Materials). 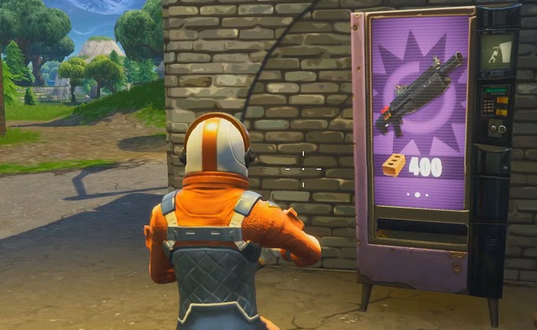 Each and every Vending Machine, when found, will offer a player three different deals on Weapons. If there is a Weapon of the three deals you would like, you can trade a specific amount of either Wood, Stone or Metal in order to obtain it. (Unfortunately, you will not be able to choose what Materials the Vending machine requires to receive said weapon). Vending Machines will automatically cycle through the three items for you to see, but you can hit them with you pick axe to speed things up. Before purchasing a weapon from a Vending Machine, you will always get to see the weapon and its given type. Unlike Treasure Chests, Vending Machines are much harder to find. On top of this, they appear randomly, so you might never find one in the same area as you did once before. Because there is this level of uncertainty with Vending Machines, you best bet at finding one is to look in named locations of your Battle Royale Map, usually within or near a house or Building. The more an area is densely packed with structures, the better your odds of finding a Vending Machine.